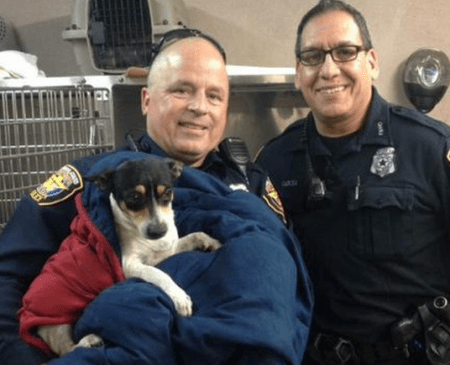 Officers Allen Speed and Paul Garcia of the Fort Worth Police Department quickly went into action when they saw a small Rat Terrier running on busy Interstate 30. The rescue was captured on their patrol car’s dashboard camera. The officers blocked traffic with their patrol car, got out and, after a bit of coaxing, lured the female stray to their car. The stopped drivers cheered and tooted their horns to show their appreciation for the two heroes. Speed and Garcia, who named the dog “Beach” since they rescued her near Beach Street, took her to the Humane Society of North Texas (HSNT). The Fort Worth Star Telegram reported that Beach was adopted Feb. 5.